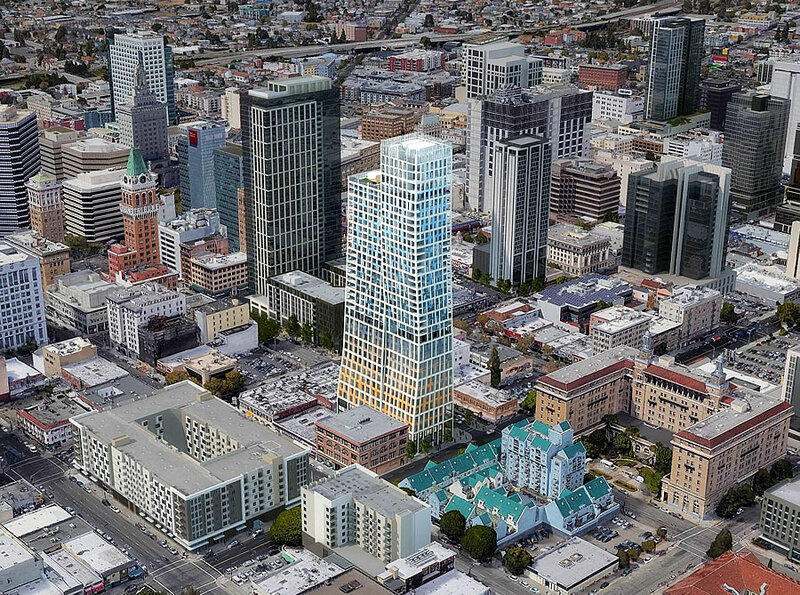 With Oakland’s Planning Commission having formally rejected the plans for a proposed 460-foot-tall, and seemingly split, tower to rise at 1261 Harrison Street, on the historic King Block in Downtown Oakland, a move which shouldn’t have caught any plugged-in readers by surprise, the project team has been working on a new approach/plan for the site (as we first reported last year as well). 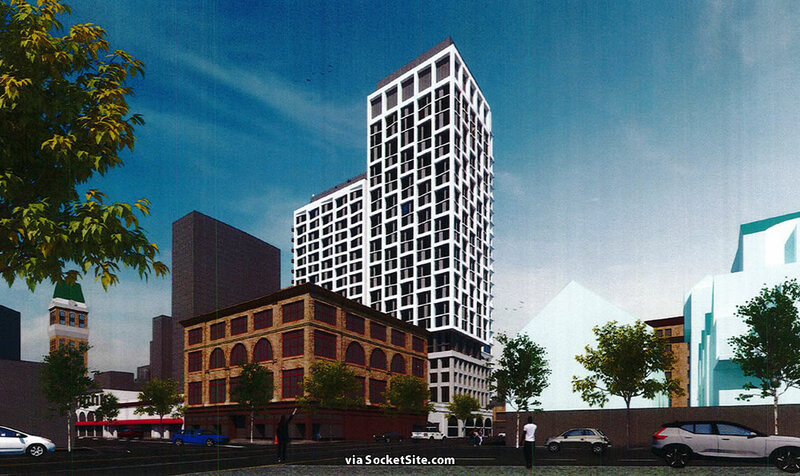 And next week, the project team will present a series of “alternative massing scenarios” for the potential redevelopment of the block to the City’s Landmarks Preservation Advisory Board. All five of the alternative massings incorporate the façade of the existing building on the historic site into their plans, and are roughly half the height of the original proposal, but with different window and podium treatments, such as the gridded approach above or the arched approach below. So a little flair in a building is unacceptable to the Oakland planning commission? Oakland needs MORE flourish in it’s cut center. The alternatives are pretty much 60’s-70’s boxy crap all over again. Wasn’t the main objection the non-retention of the existing building? If so, I don’t see the reason for jettisoning – arguably – the best part of the plan: a building that we can all experience…. w/o subjecting ourselves to the perils of the street -LSD market. What a shame. The original plan/architecture was so much more interesting and innovative. The things that pass for “historic” sites here in the Bay Area are such a joke. And yes, as mentioned by another commenter, 1965 called and thanks all involved for planting another one of its seeds in DTO 2020. Why is it that posters with handles like “Common Sense”……err, whatever, never mind. P.S., as a native Californian and preservation architect I can tell you, there isn’t much to preserve in California, so we have to hang to what we got, eh? Look at Fremont; there are probably fewer than a dozen properties worthy of preservation in a city of over 200k. Needless to say, many of the oldest and most historic buildings are located in the oldest downtown districts like “DTO.” Preserving some of them provides an interesting counterpoint to contemporary glass boxes. Downtown Oakland has an incredible number of beautiful historic buildings in its central core. Might be the best preserved big city downtown on the west coast. Oakland was passed over by developers and banks for decades. The central core where Broadway and Telegraph come together, looks like an entire preserved downtown from circa 1912 to the 1920’s. The benefits of being overlooked have now turned Oakland into a architecturally rich city. I know it’s just silly to respond, but really. You’ve got to get out of the house more often. Oakland doesn’t even have an incredible number of buildings in its downtown, let alone an incredible number of historical ones. An entire preserved downtown from circa 1912 to the 1920’s? Try South Broadway in LA, or, I dunno, most of the pre-1950 retail and business core of SF north of Market St.
I’ve been to downtown LA and downtown SF. Not even close to the number and quality of historic commercial buildings in Oakland. My guess is that you don’t know Downtown Oakland. It’s actually a very large downtown stretching from 27th street to the waterfront east of 980 and west of Lake Merritt. Just look at the picture above. You can see the beautiful Tribune Building, the gorgeous Cathedral Building, and the stately Latham Building, the Rotunda Building, Bank of America Building, I Magnum Building, Oakland Hotel, Brunner’s Building, the Key Building, Franklin Building, City Hall, Old Oakland, Preservation Park, Jack London Produce District, and much more. Some aren’t worth preserving. Just because it’s old doesn’t mean it should get in the way of development. There is significant net value gained by building high density housing versus keeping ( and not maintaining) the current structure. I agree. Not all small low slung buildings of questionable historic significance should be preserved just because they’re old. I’m referring to the many large high quality historic buildings in Oakland. And the last time I checked, the building wasn’t even being preserved. It was more of a deterorating eyesore. Has that changed? Per the article it looks like they will be incorporating the existing facade in all five proposals. 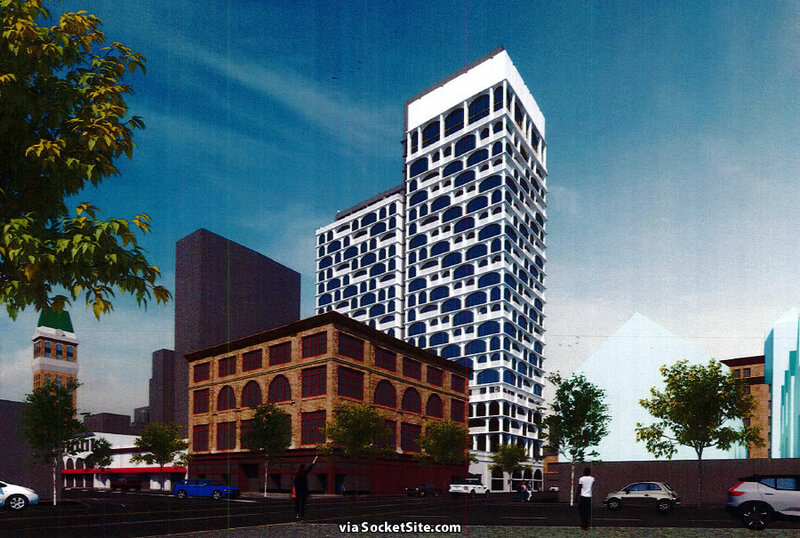 The building should be at least 460ft as originally proposed. They really should go for an iconic 500ft+ building on that spot. Something to accentuate the growing Oakland skyline. The Oakland Planning Commission is a perfect group to study if you want to know how to not get anything done and ruin projects through horrible bureaucratic delays and unchecked design-by-committee-ism. Oakland has missed the building boom almost completely and the Planning Commission’s endless handwringing and horrific decision making ability is largely to blame. Oakland is booming. I was just downtown. There is construction everywhere. Over 8,000 units under construction. Where did Oakland “miss the building boom?” Also, not too many “languishing sites” left. The empty parking lots are going very fast. It’s a fact that the building boom in downtown Oakland did not take off until well into this current economic upswing compared to other places in the region. Literally years were wasted towards the beginning under the grossly incompetent leadership of Jean Quan and the aforementioned bureaucratic mess at planning. No city ever builds out to full potential in any given boom cycle, but Oakland’s leadership ensured that they fell well short of where they should have been. I really don’t think it was leadership as much as market values/development costs. Things didn’t pencil out in Oakland until relatively recently. For anything except stick over podium that is. But I will grant you that Libby inspires a little more confidence than Jean ever did. Oh, but the Broadway Valdez Specific Plan, that was adopted under Jean (but started years before that) unleash a TON of development in the Auto Row section of town that has been coming to fruition in the past several years. Scandalous kneecapping of the graceful, colorful original proposal. Agreed. Not to mention the loss of units (I presume). I guess some housing is better than none. But honestly, this went from “amazing addition to the skyline” to “whatever.” Such a shame. Wow, that is a truly awful redesign. What did Oakland do to deserve that? And so goes a decent looking 460′ tower that would make these Oakland skyline a little better. 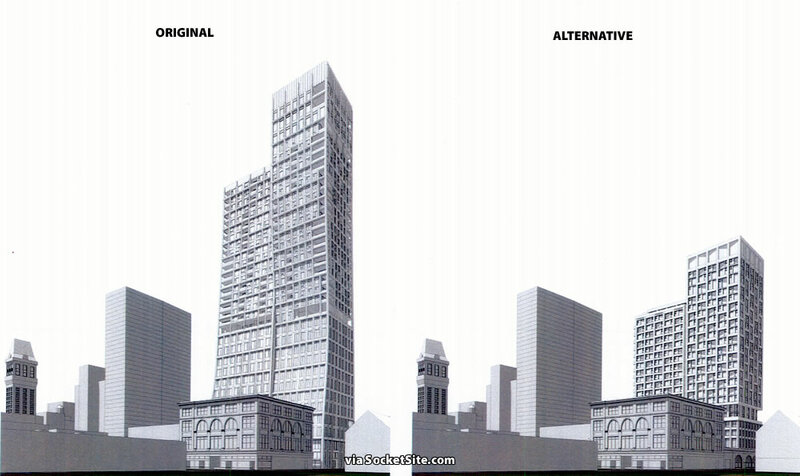 And the ham-fisted attempt to replicate the historic facade on a tower in the lower picture? That will bea bad visual joke for decades, a veritable monument to incompetent Planning oversight. Bottom one feels cribbed from David Adjaye (in the same way I rewrote encyclopedia articles for my essay homework in grade school, making them clunkier and more incoherent in the process.) But none of these are rendered with enough material detail to even guess at how they’d feel as actual buildings. Disappointed to see this is rearing its ugly head again. Why can’t they find a site that isn’t occupied by buildings with legitimate historical interest? Hope it will be shot down by the Planning Commission in the same fashion as the first proposal. The façadism is almost worse that the original jokey rendering. Terrible alternative options. Oakland needs to step into the 21st century. There is nothing wrong with mixing historic and new design. I like the new treatment, but it just looks weird at such low height. 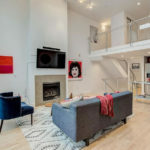 Another modern take on the arches can be found on the top 10 floors of 130 William tower in NYC.